Edward “Teddy” Reeve specialized in blocking kicks and stopping runners. Even when injured, he frequently astounded spectators and players alike with his intensity and ability. He played for, and coached championship teams, then covered the game through his “sporting extras” column in the Toronto Telegram. 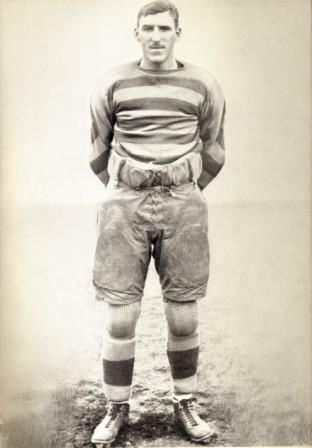 Teddy Reeve, nicknamed “The Moaner”, approached everything with a sense of humour and an unequalled spirit of sportsmanship. He is a member of the Lacrosse Hall of Fame, Canada’s Sports Hall of Fame and the Football Reporters of Canada Hall of Fame. © 2019 Canadian Football Hall Of Fame. All rights reserved.